If you’re in need of some promotional custom wristbands with your company or brand logo, you’ve come to the right place. Our website WristbandBros.com prints millions of the hottest promotional wristbands out there every single year. This is an easy question to answer. There is basically no other long-term, wearable product that even approaches the relative value of the promotional bracelet. People tend to wear them for long periods of time and while they do, they’re acting as your own personal spokesman. How many times have you asked someone about their bracelet during idle conversation? Now control that conversation and interject your brand into the dialogue. We’re talking almost free promotional advertising long after the money cost of the wristbands is realized. How much would you pay to have a person walking around as a personal billboard and testimonial? If you answered 50 cents, well, you undervalue what we’re selling here. But you’re in luck. Because custom wristbands are super cheap. You can puchase plenty of our wristbands at price points of 50 cents or less. 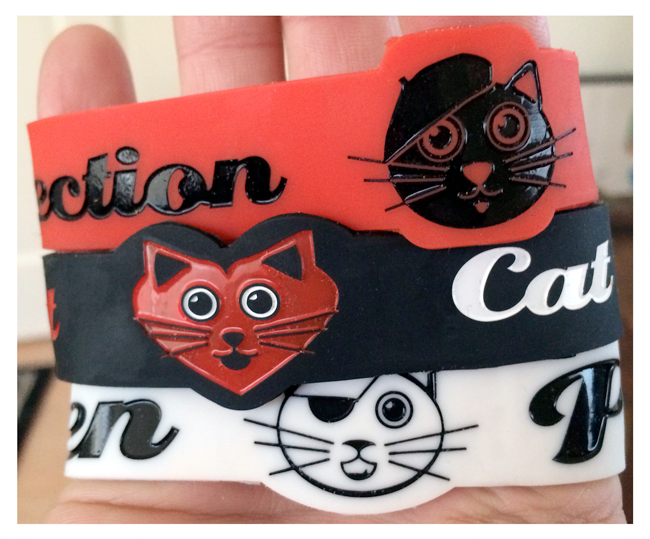 Get The Cat Pack Wristbands Now. Three Wristbands For A $5 Bill.